Whether you’re shopping for your first Colorado home or you’re looking to downsize after the kids have gone to college, house hunting can be a stressful time. As you interview different real estate companies and start hunting for the perfect place to call home, there are many things you’ll want to keep in mind along the way. One main thing you’ll want to be aware of on your house tours is any signs of pest infestation. The last thing you want to do is purchase the home of your dreams, only to learn that there is a critical termite infestation in the attic. Not only will this cause safety hazards to your home and the people inside of it, it can lead to costly repairs down the line. In this blog, we’ll discuss some common signs of pest infestation to be aware of as you tour various homes throughout Colorado. 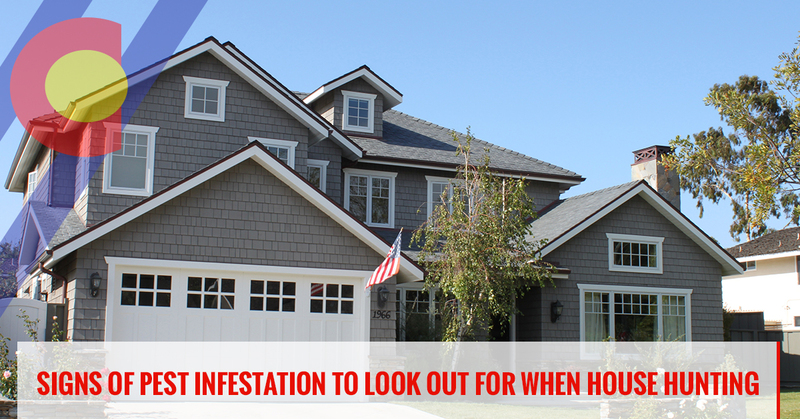 As you start to tour homes around Colorado, it’s important to keep an eye out for any signs of pest droppings. This is the most obvious sign of a pest infestation, and a pest control specialist will be able to help you identify the type of pest that is living in the home. Rodents, cockroaches, and other insects are very clever when it comes to hiding, which means you may have to look for pest droppings in out-of-the-way locations. As you tour the kitchens and bathrooms of potential homes, take a look under appliances and in cupboards to identify signs of pest droppings. You may see signs of rodent pellets and urine stains that indicate a pest issue, which is something you should bring up to the homeowner. Another common sign of pest infestation is gnawed, torn or shredded food packaging. As you tour various homes, take a close look in the closets, pantry, and cabinets for any signs of torn food packaging. If you come across anything that looks out of place, it may be due to a rodent or pest problem. Wood-destroying insects like termites and carpenter ants are the bane of many homeowners’ existence. These little pests are very hard to detect, but if you notice small piles of sawdust or powdery residue near wood furnishings in the home, it may be the handiwork of pests. If you start to notice piles of sawdust around window sills or interior molding, you may want to call a pest control specialist right away. As you start your search for a new abode, keep an eye on the landscape and yard of all of the potential homes you tour. Damaged patches of lawn, such as uneven grass length or dead grass patches, can be a clear indication of a pest infestation. Whether the issues is caused by moles, beetles, or termites, a pest control specialist will be able to help. We hope that this article is helpful as you start to tour homes in Colorado. If you need a professional pest control company, contact Colorado Pest Management today.